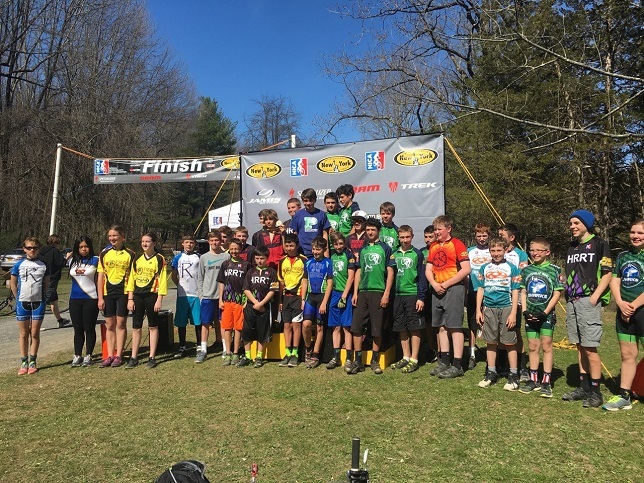 Atlantic Beach, NY - April 19, 2016 - Long Island Hurricanes Youth Mountain Bike Programs competed in this season’s first race this past weekend. Based in Long Beach & Atlantic Beach NY and sponsored by Brands Cycle and Fitness and Muscle Milk Nutrition, the Hurricanes Program is part of NICA (National Interscholastic Cycling Association ) and competes within the NICA NY league. After the season kick off race scheduled for April 3rd in Peekskill, NY was cancelled due to extreme weather - the hurricanes riders were eager to tear up the trails and show how hard they had worked in the off season. Mother Nature cooperated with sunny skies, light breeze and 75˚ temps along with a dry and fast course. Over 300 of NY States best riders representing 22 teams from across all corners of the State competed in the NICA race. Hailing from as far as Cazenovia, Syracuse, Chenango, Albany, Rochester, Cooperstown these riders came to ride hard and win. In the High School 12 mile XC race Competition was fierce and the excitement was intense as the riders navigated through challenging single track, rock gardens, skinny boards, rocky - rootie descents and grinded up steep and rocky climbs. When exiting the woods on the last lap, Bronxville High School Rider, Tyler Stupart was leading by 50 meters with Long Island Hurricanes Rider Chris Trimble ( Kings Park, NY )12 seconds to finish second. Caught behind a crash, after a spill in a rock garden Chris worked his way back up to the leaders, putting in the fastest lap time of the race at 16:12.81. Chris’s Highest Finish was last season was 12th place, his diligent offseason training now paying huge dividends. Finishing out the Hurricanes High School Race were 11th place - Cole Eisenberg of Yaphank, and 14th place - Chris Thompson of Centerport. The Middle School Race XC at 9 miles was on slightly less technical and the competition just as fierce. Benjamin Zelenetz ( Atlantic Beach, NY) finished just off the podium in 7th, Stephen Verderame ( Huntington) in 10th, Christian Symons ( Huntington) battling back from respiratory infection decided to complete the races as training and surprisingly place in the top 20 - at 17th place. Christian Symons, winner of last years Muddy Tire Race and 2nd at H2H, will be a force to be reckoned with as his form returns. All injuries were relatively minor and were addressed by the Race Medical Staff on site. A great time was had by all at the traditional post race tailgates and award ceremony. Non racing weekends - weekly training rides Bethpage, Cathedral Pines, Cunningham Park, Stillwell Woods, Glacier Ridge Edgewood Preserve, Valley Stream State Park, Trail View, Rocky Point. Wednesday evening rides Bethpage State Park. 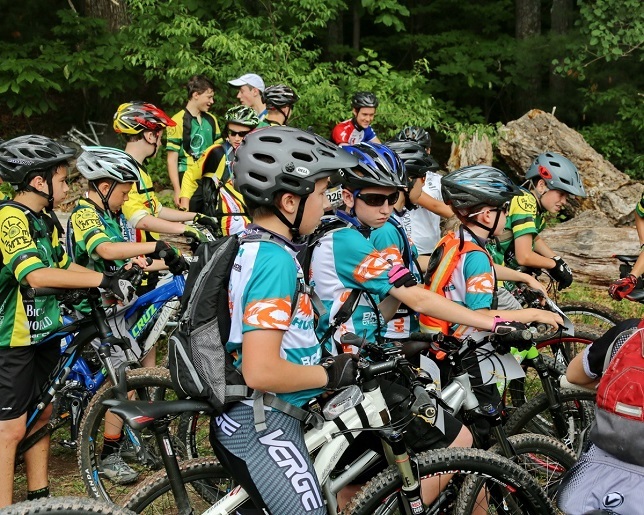 The Hurricane Program is is dedicated to provide competitive mountain biking programs for Middle School and High School students in Nassau County. 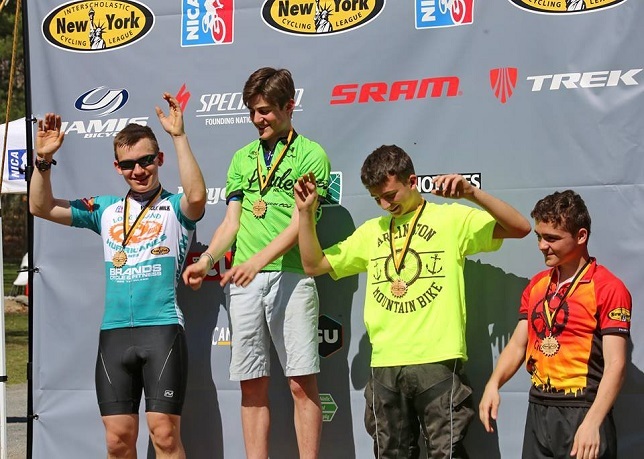 Through our parent organization NY High School Cycling League and affiliated with NICA (National Interscholastic Cycling Association); along with the cooperation of local race organizers, our partners, and our sponsors, we are able to provide a high quality mountain bike racing experience. Regardless of ability level, the New York League is committed to providing a positive experience for all student-athletes. There is not cost to ride with the Hurricanes, but you must join NICA. All coaches are wilderness First Aid certified and the team director is a former FDNY -Advanced Lifesaving Emergency Medical Services EMT-CC. Weekend training rides & clinics, wednesday evening rides, USA Cycling and NICA races, Special events - weekend bike packing trips ( parent must accompany child ) - Parents are encourages to participate on our training rides. For more information visit www.limtb.org or email.